Hostel Shappy i Zagreb, Kroatien: Reservér nu! 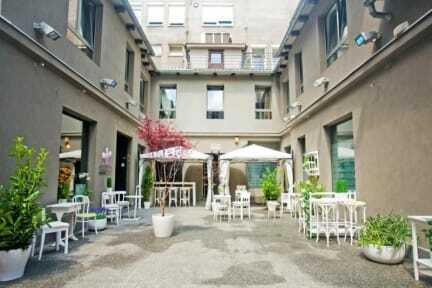 Hostel Shappy is the newest hostel in Zagreb. Situated in the heart of the city, it provides its guests an opportunity to start their journey of falling in love with Zagreb. The hostel is in the pedestrian area, with its own parking area and just a minute from the main street and the main square in Zagreb. Just a couple of meters further from the hostel, guests can begin exploring the city's best: cafe bars, restaurants, night clubs and plenty of cultural sites and churches. Our hostel is also close to the old part of Zagreb, called the Old City, crawling with interesting museums and also the residence of Croatian parliament and government. As our wish was to create a warm place so tourists who are visiting our city could enjoy their stay, we have thoughtfully brought together a group of young, hard-working and communicative people to make our hostel a special place. Also, being the newest hostel in Zagreb, our hostel holds six originally decorated rooms, each one in its own style. Wanting our rooms appearances to match different tastes, personalities and backgrounds of our greatly welcomed guests, we have especially thought through different styles, and decorated our rooms according to that. Starting with the Romantic room designed for couples that want a bit of their own privacy, along go the Green room and Stripey room each with their own specific ambience. Next we can offer our customers is the Happy and Swag rooms which are divided but share the same entrance door, so they are perfect for bigger groups. Apart from all that, we have the Cool suit that has two rooms and its own private bathroom. All of the rooms listed above are equipped with air-conditioning and free Wi-Fi. Beds in all rooms are provided with linen. Although our hostel is in the pedestrian area in the center, we have our own parking area which is half a minute away from the hostel. Free private parking is possible at a location nearby (reservation is needed). Please be advised that we cannot be held responsible for any loss or damage of your car. The whole Shappy team thanks you for your interest in the Hostel Shappy and would be delighted to receive a booking from you in the near future. We look forward to welcoming you to our city of Zagreb and our Hostel Shappy!